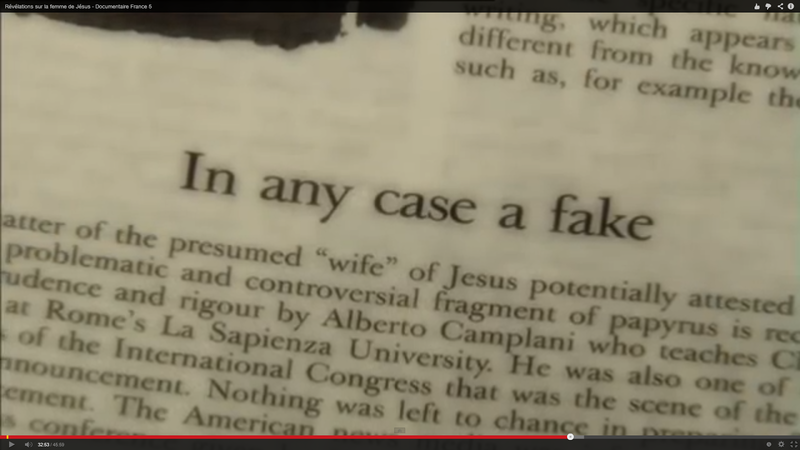 Back in September 2012, Smithsonian Channel were planning to air a documentary on the Gospel of Jesus' Wife. Once it became clear that there were several in the academic community who were uncertain about the authenticity of the piece, Smithsonian postponed the documentary and to this day it has not been broadcast in the USA. The film has French commentary rather than subtitles, so you will need competent French to be able to follow it. I must admit to enjoying watching the documentary. It is beautifully produced, it largely avoids sensationalism, and gives lots of screen time to the three key players in the story, Karen King, Roger Bagnall and AnneMarie Luijendijk. Luijendijk is even flown to Cairo for the documentary and discusses the Gospel of Philip there. She also visits Nag Hammadi and gives the story of the find (genie and all) over against a new dramatization of the find in a one-person version. The only other academics who appear in the piece are Dom. Henry Wansbrough, in Ampleforth, Robin Griffith-Jones, Master of the Temple in London, and Alberto Camplani, who speaks to the issue of the authenticity of the fragment. The documentary goes to King and Bagnall after the authenticity issues are raised, but the footage of them appears to be drawn from the same filming some time before September 2012. It will be interesting to see if the documentary does eventually appear on screen elsewhere, and it will be interesting to see also if the articles about the fragment appear in the Harvard Theological Review this year. Thanks to Andre Gagne for the link to the Youtube version of the film. The work is by Aaron Soldner and it is hosted at Spark and Echo Arts. Thanks to Nathan Sherrer for letting me know about it. Nathan tells me that anyone who would like more information or would like to connect with Aaron can write to him (jonathon@sparkandecho.org) or to executive director Jonathon Roberts (jonathon@sparkandecho.org). APB Prescreening Interview Duke-720 from A Polite Bribe on Vimeo. See this link for my posts on: A Polite Bribe. It includes trailers and lots more information about the film, including excerpts of the featured scholars, including local stars Douglas Campbell and Bart Ehrman. This week the film comes to Duke. 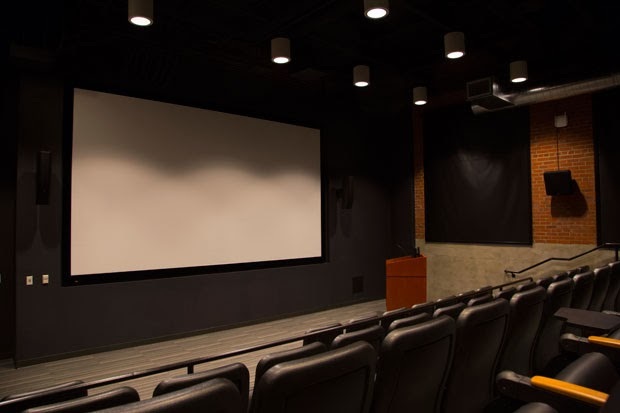 On Thursday 23 January, at 7.30pm, please come along to the free screening at the Full Frame Theater on the Tobacco Campus (pictured below). There are also two bonus events. First, at 6pm, I will be interviewing the director Robert Orlando. If you can make it for this event, please be there in good time because the event is being recorded and we will close the doors at six. There will be a 30 minute break between the interview and the film's screening at 7.30. After the screening, there will be a panel discussion featuring director Robert Orlando and participant Douglas Campbell. This event is free and open to the public, but space is limited, so please get there early. Don't worry if you can't make it for for the pre-film interview at 6pm; we are expecting the largest audience for the film screening itself. If you have any questions, please be in touch. I look forward to seeing you there. A couple of highlights: some discussion of a "Christian Zionist" viewpoint at the mid-point of the episode, and a reference towards the end to Dr Stavrakopoulou's hate mail. Before posting this, I thought to myself, "I bet Jim West has already posted on this," so I took a look and I was not wrong! It uses a blog format, with individual tagged posts, to create a nice series of topics that can expand as time goes on, covering a good, full range of topics of interest to scholars and students of the NT. I particularly like the stress on audio and video resources, and I've already found all sorts of things I did not know existed (like Chris Rowland lecturing on William Blake). I am looking forward to watching this site develop and to discovering lots of new resources. I've added a link over on the NT Gateway, on the Biblical Resource Index Pages page. Here's the latest from the Library of New Testament Studies. Interested in making a proposal to the series? Please get in touch with me, or see the further information and proposal forms. The Library of New Testament Studies explores the many aspects of New Testament study including historical perspectives, social-scientific and literary theory, and theological, cultural and contextual approaches. Explores the attitudes to Gentiles in ancient Jewish literature and in many of the New Testament texts. This volume argues that the throne motif constitutes the major interpretive key to the complex structure and theology of the book of Revelation. An examination of the composition of the gospel of Luke with reference to the Elijah-Elisha narrative. Adams examines the evidence surrounding house churches in Early Christianity. Investigates the reason for Paul's seemingly inconsistent financial policy, insofar as he accepts monetary aid from the Philippians but refuses it from the Corinthians. This study shows the scriptural justification for the expectation that the Eucharist is a place where God will bless believers with freedom and formation. Examines the two key Pauline texts that link the confession of God as one with the inclusion of the Gentiles. 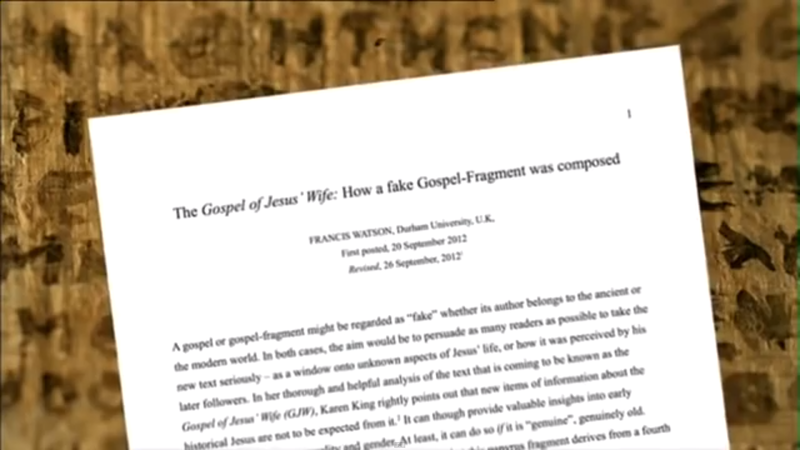 Cooper argues the Gospel of Matthew was composed in part to evoke a commitment to God through which 'compliant' readers are made disciples of Jesus. No longer want to receive emails from this list? Unsubscribe. 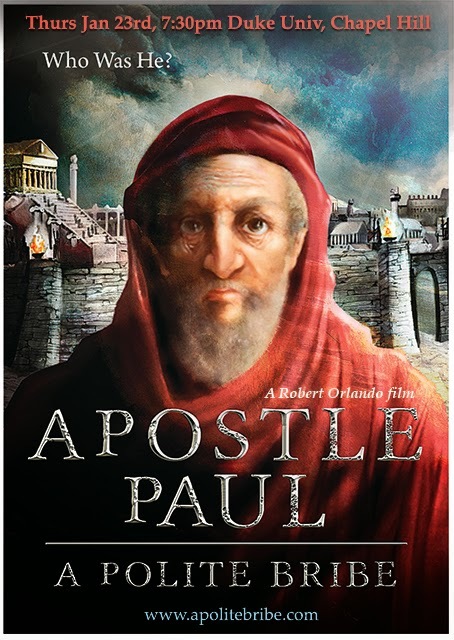 I have previously mentioned Robert Orlando's film A Polite Bribe, a documentary that uses animation and interviews with top New Testament scholars to tell a compelling narrative about Paul's life. On 19th December, I was invited to the the New York City premiere of the film, and so I got a chance to see it on the big screen, to meet Robert Orlando and others involved with the film, and to witness a fascinating post-film discussion. The screening took place in the SVA Theater in West 23rd Street in Manhattan which was, as it happens, just a short walk from my hotel. It was great to see a film about the New Testament getting this kind of billing, and to see a New Testament scholar's name up in lights! Gerd Luedemann, who features prominently in the film, was the guest of honour, and he gave a short lecture as a kind of pre-screening extra. 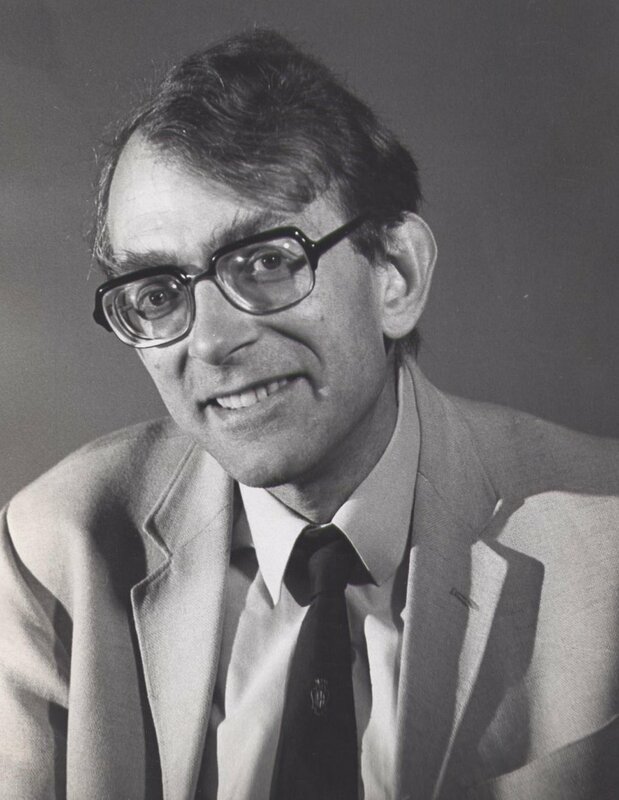 Prof. Luedemann's style is old-fashioned but authoritative -- he held open his book and read radical statements with a calmness that belied content that would be surprising to many in the audience. Luedemann really came alive in the question and answer session, though, and when it was time to pause ahead of the pre-screening break, the questions from the audience were still coming thick and fast. The film itself is quite original. As regular readers will know, I am something of a consumer of documentaries about the New Testament, and I can't recall having seen anything quite like this. Its chief focus is on Paul's collection for the saints in Jerusalem. It tells the story of Paul's troubled relations with James, Peter and the other apostles in Jerusalem, and explains how he became fixated on what it calls his "polite bribe". sense of this as another world. Orlando avoids usual documentary distractions of shots of present day Jerusalem, Antioch, Corinth, and so on. But most strikingly, the story is told primarily by means of multiple modern-day Biblical scholars. Many of the top shots are there. They include documentary regulars like Bart Ehrman and Tom Wright, new documentary stars like Candida Moss, and many I have not seen before on film, Philip Esler, Douglas Campbell, Amy-Jill Levine. Orlando seems to get the best out of them all. Ben Witherington III appears often and is surprisingly amusing. Indeed, many of them appear relaxed and even humorous, perhaps because they all get a little more than the usual twenty second soundbites. I was impressed by the way that the film manages to weave a story that scholars know well into a narrative that would be comprehensible and compelling to those with no knowledge of the field. It's certainly something I would enjoy using in the classroom, but I suspect that those who will enjoy it most will be those who are unaccustomed to reflecting critically on Paul's biography. Although the film occasionally utilizes the Acts narrative, it tells its story primarily by means of an epistles-based chronology, and it is this angle that will prove refreshing to scholars who try so hard to underline the importance of beginning with the letters. And from a scholarly perspective, perhaps the most surprising thing -- and something I asked Orlando about in the Q&A that followed the screening -- is its integration of scholars from a variety of different perspectives who end up telling a continuous story, from Luedemann to Witherington, from Ehrman to Wright. A Polite Bribe is not perfect, of course, and students and scholars of Paul will have their niggles. I felt that it telescoped the separate Jerusalem visits of Galatians 1 and 2 in such a way as to make it a little confusing for those unfamiliar with the text, and I shared James McGrath's puzzlement over the conflation of the terms Nazarene and Nazirite. Paul also becomes a more lonely and isolated figure in the film than I think is likely to have been the case given the friends and partners in mission that we repeatedly witness in the letters, but this is, I suppose, a necessity of effective story-telling. 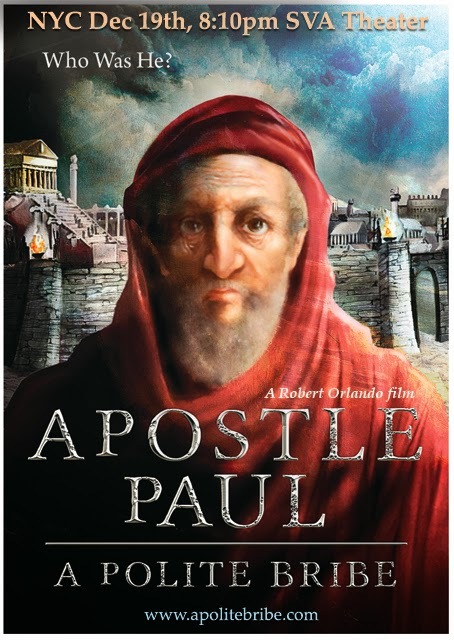 Overall, though, the film does a great job of illuminating Paul's life by focusing on a key issue, the "polite bribe" of the title, that is little known outside of academic circles. After the screening, there was a Q&A chaired by Dave Gibson of the Religion News Service in which Robert Orlando responded to questions about the film and how he put it together. There was some (but much less) response also from Gerd Luedemann. I'd recommend the film to anyone interested in Christian origins. Several screenings have been advertised for the coming weeks, and we have one at Duke on 23 January, which I'll discuss further in due course. Update (10.10pm): Joshua Paul Smith has an interview with Robert Orlando about the film on the Near Emmaus blog.